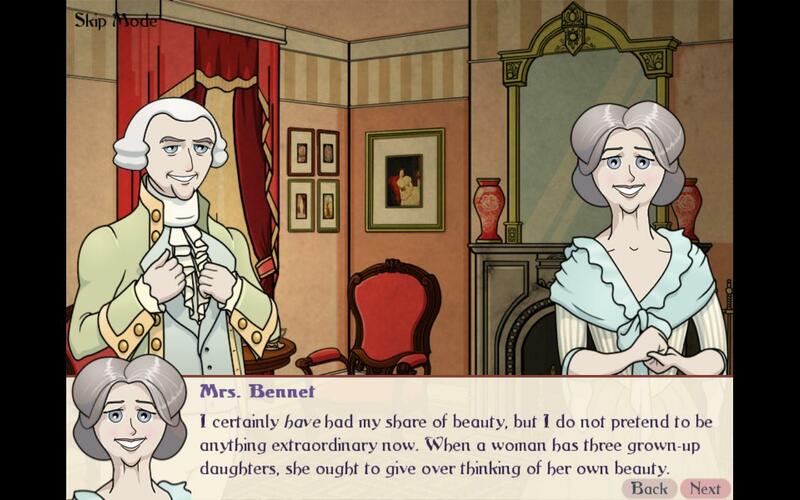 I had low expectations for a visual novel computer game based on Pride and Prejudice, but I was rather elated to play this somewhat elegant adventure. Reflexive Entertainment has brought us this Russell Carroll game that you can download for a one hour trial (quite sufficient for a bit of light entertainment) or for $7.27 discounted price over at Big Fish Games. While I thought it would be a virtual version of Being Elizabeth Bennet (and to some extent this is true) the different aspects and even the game play were all executed in quite a new way. I have to admit, that screenshot looks a little daggy. But combined with some beautiful music from Isaac Shephard and some elegant prologue/chapter dividers, and a role playing point-and-click style, it turns an amateurish production into a rather memorable gaming experience. I now look upon the images as a bit more vintage style old school computer images, even if something that 2D is a little paperdoll painful. The sequel to Pride and Prejudice and Zombies, and the last in the trio. By Steve Hockensmith. I received this advance review copy from Quirk Books two days ago. It comes out soon for everyone else to rock up to the shops and buy. And I really do suggest you do, as this was my absolute favourite of the three with plot twists, romances, intrigues, ninjas and, um, brains every second of the way. I predict big things for this book (especially considering the other two were NYTimes best sellers) and have been pretty excited for it! Bee is a mother to three young daughters and a London resident. She’s also a journalist, school fair organiser, tea drinker and generally busy woman juggling married life, family illness and holidays abroad. May is a lecturer, teaching Jane Austen and democracy to girls, and has a preoccupation with coffee, smoking and her hair. She’s also an Iraqi living in Baghdad. A lot of literary criticism is hard to get into. From my highschool extension english days, and my university readings, I know that a lot of it can be plain painful. However, occasionally I come across something that is so worth reading, and such a joy to read, that I want to share it. And who better with, than other Pride and Prejudice fans? Especially when the title of said essay is as enticing as it is. This book managed to irritate and entertain in different parts. Perhaps it was the lack of choices, rather heavy reliance on a point system and the often awkward inclusion of characters, but it left a little bit of a bad taste in my mouth. If you’ve read a “Create your own Adventure” novel before, you will know what this book has in store when it subtitles itself “Create your own Jane Austen Adventure”. For the others, I will explain in full. Disjointed storylines are symptomatic of this book genre, a genre of which I am admittedly not a fan, and Webster did have a better attempt at it than most.